Tahoe Chamber's new South Shore Beer Trail highlights the area's craft breweries. South Shore’s craft beer scene continues to grow in size, making it increasingly difficult to keep track of the latest spots to grab a drink. But with Tahoe Chamber’s all-new South Shore Beer Trail, questions like “Where is South Lake Brewing Company?” and “Isn’t there a brewery near the DMV?” will no longer be necessary. The chamber, along with its member breweries, has put together a map highlighting each location. Looking for the hottest places to try a new brew has never been easier. The Brewery at Lake Tahoe, Cold Water Brewery & Grill, Lake Tahoe AleWorX, Sidellis Lake Tahoe, South Lake Brewing Company and Stateline Brewery & Restaurant are the establishments included on the map, which was designed and illustrated by Tahoe Chamber staff member Vanessa Lopez. The chamber encourages those who wish to complete the trail to avoid driving and seek out alternative modes of transportation. 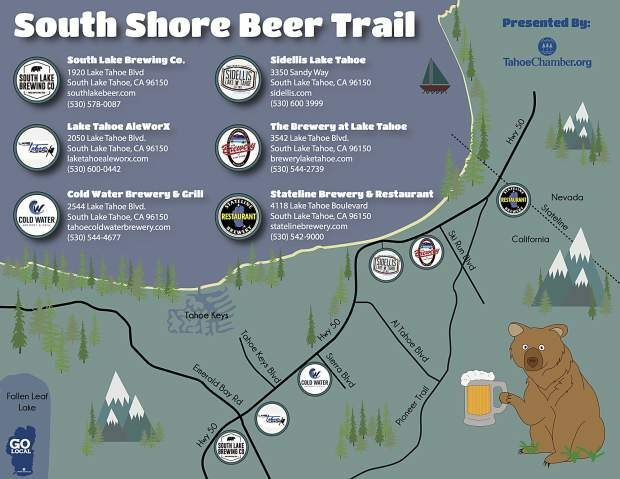 The South Shore Beer Trail map is available online at http://www.tahoechamber.org/beer-trail.